When the Ravens intentionally took a safety, to give themselves better field position and run a few seconds off the clock, it brought the 49ers to within three points. It was the smart call, but it also raised the possibility of the rarest of all football plays—the fair-catch kick. It's only been attempted a handful of times in the history of the NFL, and hasn't been done successfully since 1976, but the very unique set of circumstances put it into play. And if it didn't happen last night, it'll probably never happen. Put simply, the 49ers could have signaled for a fair catch, and on their first play—even if there was no time remaining on the clock—attempted a field goal from that very spot. What's more, the defense cannot line up within 10 yards of the fair-catch kick, meaning the kicker can aim low and kick much farther than usual. It's a bizarre rule, one that remains in the rulebook probably through inertia. As you may have guessed, it's a holdover from football's rugby origins. The "goal from mark" was a similar rule that allowed players to take an unmolested free kick from the spot they received a fair catch. But rugby league removed the rule in 1922, and rugby union in 1977. Only pro and high school American football retain the vestigial rule. It comes into play on occasion, almost always at the end of a half, following a punt from deep in Team A's territory. With no time remaining, Team B's only option is to try a fair-catch kick. The blog Quirky Research counts 22 regular season and two playoff instances of the fair-catch kick being attempted since 1925. And here's Mason Crosby, also in 2008, with 69-yard attempt that comes up just short. The fair-catch kick wouldn't have been the best idea for San Francisco last night. As it was, Ted Ginn Jr. received the ball at his own 19 (much too far away to attempt a kick) and with four seconds left (a hail mary or a return attempt is almost always the higher percentage play). But it might have been different. Because it was coming off a safety, Baltimore wasn't allowed to use a tee to kick off. Sam Koch punted from the Ravens' 20, and if he had shanked the ball only 30 yards or so, a fair catch, followed by a fair-catch kick would absolutely have been the smart call. Not only did Koch brilliantly waste time before taking the safety, but he connected on the punt, making a Ginn return San Francisco's only hope of scoring. And if Koch had punted short? 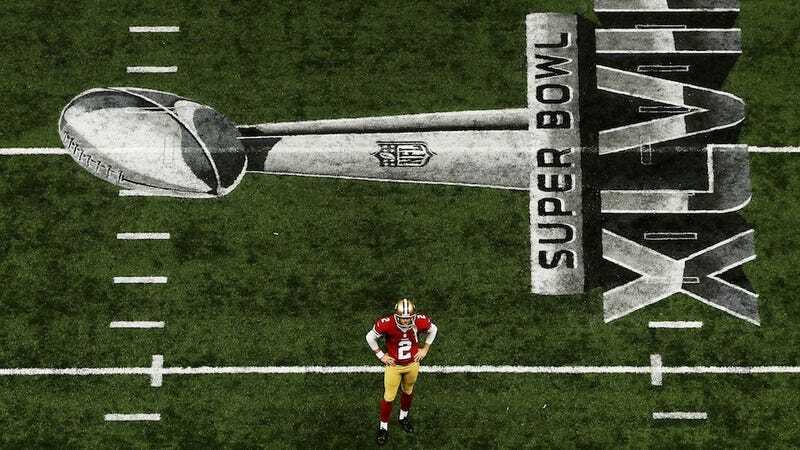 The Super Bowl could have come down to the shaky David Akers from distance, no snap, no defenders in his face, 60-something yards to overtime. Maybe next year.